Growing up in Tehran and only 20 minutes away from Alborz Mountains we spent a lot of time hiking as a family. My dad taught me how to be patient and listen to my breath and find the rhythm. My mom taught me how to enjoy nature, she has the most angelic voice you can imagine and she would sing for us while hiking. My brother and I both loved cycling, but he was more determined than me. He followed his dream and cycled alone around Iran in 3 months. My sport in college was trekking and mountain climbing, anytime I got a chance I would go and spend days in mountains with my friends. When I moved here in 2007, I immediately realized that I needed to find a new hobby. Something extreme and challenging, new goals. I was never a runner, nor a cyclist. Growing up in Iran as a girl makes developing those sports very tough. I only knew how to swim breast stroke and that was it. My first 5k was in 2012 and it took me one hour, because I had to lay down half way through to rest. yup! 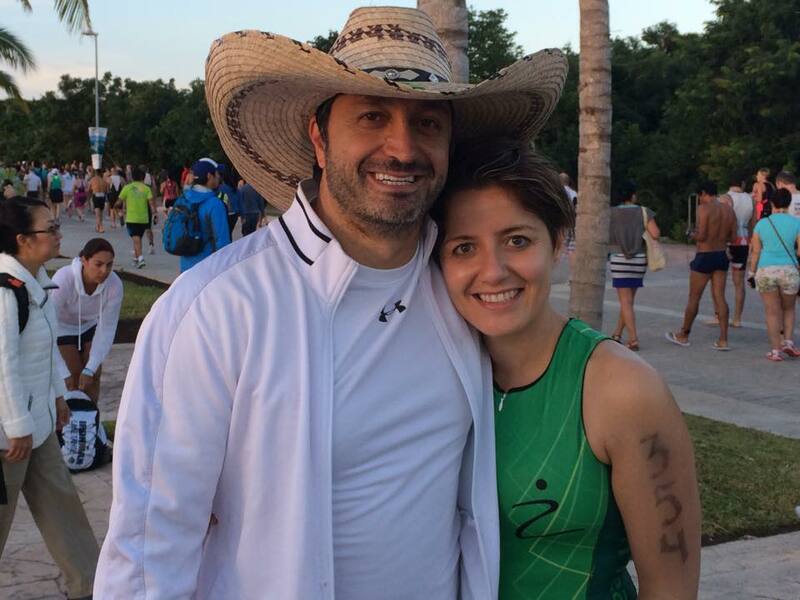 My first Tri was a local Super Sprint in 2012 and I became 3rd in my age group. Yeah, you guessed it right, there were only 3 girls in my age group. 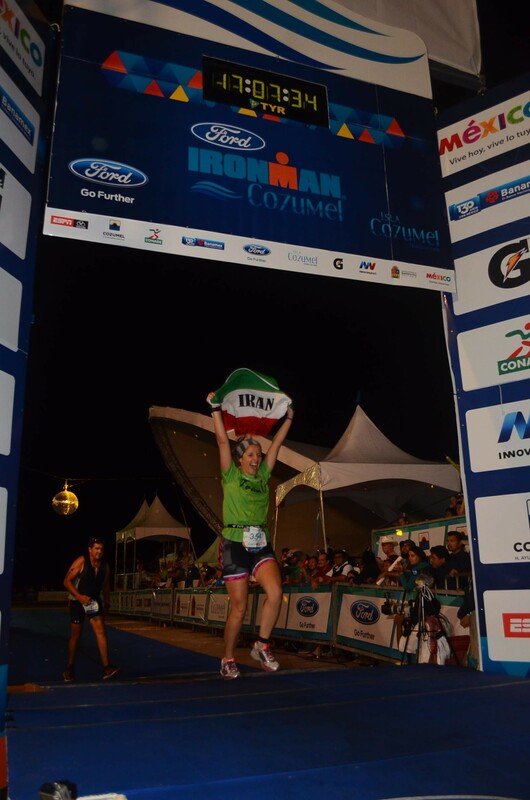 Ironman was always a dream, but never thought I had it in me to become one. I became addicted to spinning and would join my friends every day and spin at CycleLuv. 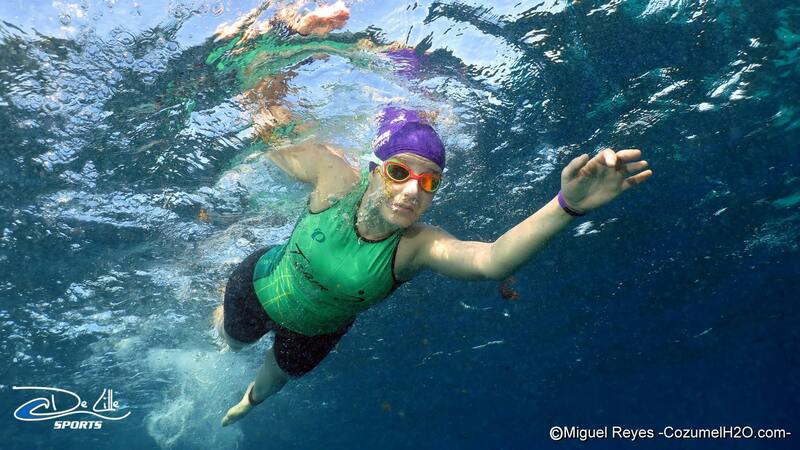 An Olympic Triathlon was the goal for 2013. So I found Team Z and joined. The first swim practice that I showed up to was in March of 2013, with my race being in May. I couldn’t even swim one whole lap of Freestyle. Alyssa, Ryan, Jessica and Kiki were the most patient, consistent and loving coaches anyone could ask for. They somehow managed to teach me how to swim free style. I bought my bike (second bike ever!) in March and used every chance I had to ride my bike. 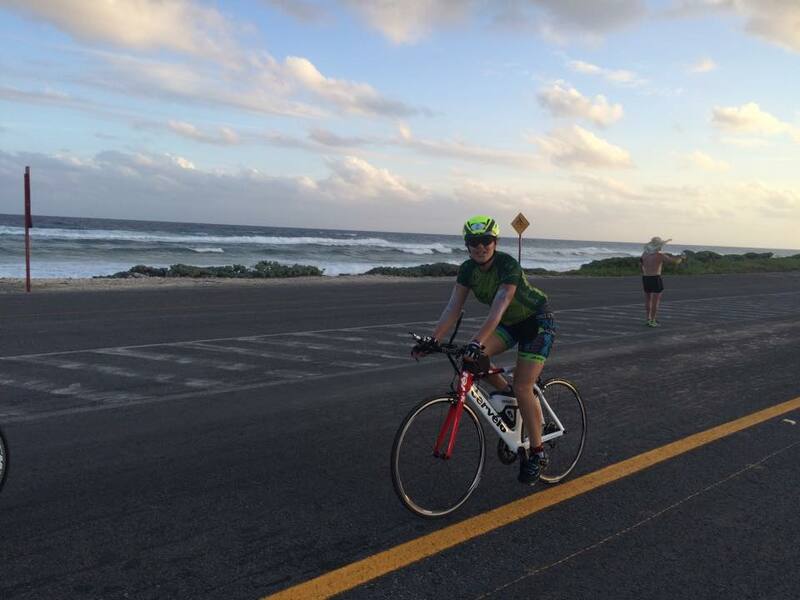 My first Tri with Team Z was Kinitec Sprint and I knew there and then that I was in love with The Team. Jean taught me how to set up my transition. She called me on the phone talked me through packing and helped me set it up on the race day. I don’t think I could do it without her! 2013 was busy, I raced almost every weekend and finished the season with Watermans Half Ironman. My bike was too small for me and was giving me knee issues. 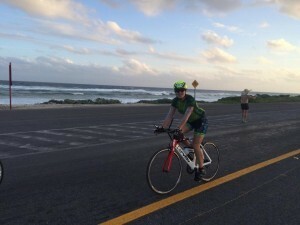 One day as I was hopelessly trying to find a way to get a new Road Bike, Ryan told me that one of the generous Zers had donated her Tri Bike to the team. I tested the bike and it was a perfect fit! How lucky can one be? I will forever be grateful. Bill at Bike Lane (The Wizard) and I had many many days spent in the shop and finally the bike and I were ready for the journey. As Bill says, “I was so comfortable that I could be in aero and put a pillow and take a nap while biking”. The week before the race went fast. I was nervous about the swim and was wondering how things would go at the end of the day. Goal: Smile, have fun and don’t bonk. As we got to the swim start I started to calm down. Bobby surprised me and came to see me before the swim and boy did I need to see his smiling face! I was joking around and talking with people at the start of the race and missed the announcement of my name and the fact that I was the only athlete from Iran competing. I couldn’t ask for a better swim, this was the most gorgeous swim I have ever done in my life. Due to the phobia of Barracudas, I kept my arms really close to my body in the water. I got stung a million times by Jelly Fish and it didn’t even matter! It only itched for a second and was gone. Every time I felt the faster swimmers coming by me, I would keep my face out of water so they wouldn’t kick me in the face.Finally got to the last turn buoy, I had the biggest smile on my face. There was a camera man under the water taking pictures of us. T1 was as fast as could be, 15 minutes. I changed in to my bike gear and left with my bike. Goal: 8 hours. Actual: 8:19. 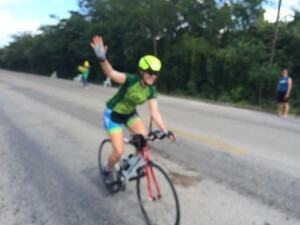 I held back on the first loop of the bike, the coaches ‘ voices kept ringing in my ears :”no matter how good you feel don’t push too hard the first 10 miles.” Mary Pickering was kind and shared her bike checklist with me which was an absolute life saver. As the day went by and my brain stopped working the checklist helped a ton. It was easy: Hour X, be at Y millage and eat this. I nailed my nutrition on the bike, never felt better on a long ride. I drank a ton of water, basically every aid station I would grab another bottle and drink that through out the hour. 2. The locals cheering for you. 3. Bobby on his scooter showing up all over the course. 4. Team Zers cheering with cow bells. On the back of the island hearing the sound of the cowbells was like seeing a small light at the end of a long tunnel. 5. Coach Alexis in his Speedo and sombrero. I never biked faster to get away from something. Awesome, just awesome! On the second loop of the bike at the turn around point to come back in town, Coach Ed came with his scooter and said,”Now you need to focus and stop only if you have to! I better see you on that run course!” That was when I realized I needed to push harder and get in before the cut off time. The 3rd loop on the bike got tough, the winds were vicious. I stayed low on the bike and ignored my speed. Pretty sure at some point I was going 9 mph. I did everything I could and made it in T2 before the cut off time! I made it! T2 was quicker 10 mins. I changed everything and went for the run. My race plan was to run and walk every aid station. As soon as I started running my HR went to Zone 4. So I decided to walk for a mile or two. The HR was not coming down and I didn’t want to faint. I had to come up with a new plan, and decided that I would run until the HR goes to Zone 4 then I would power walk to bring it back down. On the course I saw the Zers and it warmed my heart. The cheer stations were full of energies. I saw Bobby and hugged him, I so needed that. Just reassurance that I still could do it. 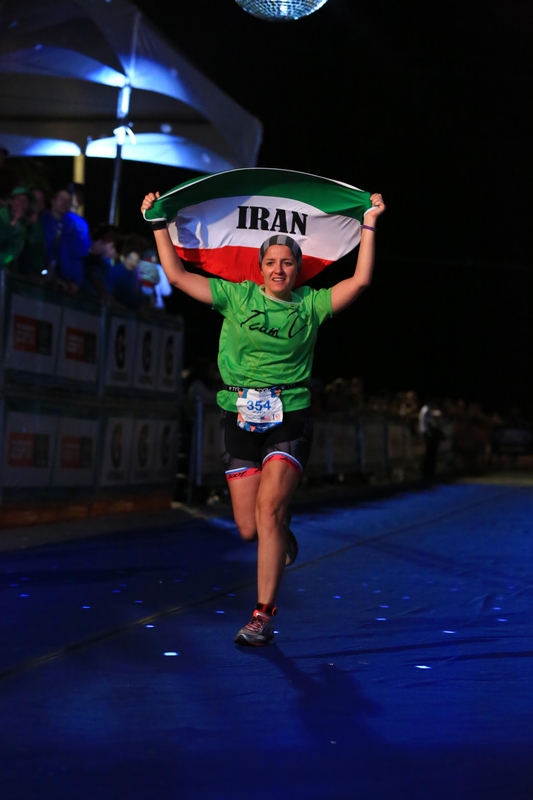 On mile 13 I went to my special needs bag and grabbed my Iranian flag. Wrapped it around me to keep my warm as I was getting chills. The saddest part was when I saw Daniel and Nathalie go to the finish shoot and I had to do another 8 miles. During the run I realized that I needed to stay positive so I danced every cheer station that had music. People would dance with me. That made everything more fun. What went wrong with my run was that I didn’t take enough food and salt in. Instead I kept drinking water and pepsi. I hate heat and humidity and the weather got to me.